Liverpool were held to a 1-1 draw by Chelsea in the Premier League encounter at Anfield on Saturday evening. Mohamed Salah broke the deadlock midway through the second half when he converted from close range after the ball ran for him inside the box. However, Willian levelled for Chelsea on 85 minutes when his attempted cross towards the back post drifted goalwards and over the head of Simon Mignolet. Salah was then denied by a Thibaut Courtois save in added time as the spoils were shared on Merseyside. Jürgen Klopp made five changes for the fixture as Daniel Sturridge and Alex Oxlade-Chamberlain joined the attack. Joel Matip returned after injury, while Mignolet and James Milner also started. Roberto Firmino and Sadio Mane were on the bench, along with Adam Lallana for the first time in 2017-18. Dejan Lovren and Emre Can missed out altogether due to injury. With kick-off greeted by a deafening din inside Anfield, Liverpool began assertively and looked to grab an early foothold in the game. Salah registered the first shot of the evening after eight minutes, swiping over the bar from Sturridge’s neat layoff on the edge of the box. Next, Milner sliced wide from 18 yards out after Oxlade-Chamberlain had escaped into space down the left and centred the ball. At the other end, Eden Hazard threatened when he cut inside at the conclusion of a counter-attack and drove low towards the near post, but Mignolet was able to palm it behind. The Reds needed their goalkeeper to keep the scoreline level with 23 minutes played when Hazard slipped Danny Drinkwater through on goal; the Chelsea midfielder’s attempt to prod home was foiled by a sprawling stop. 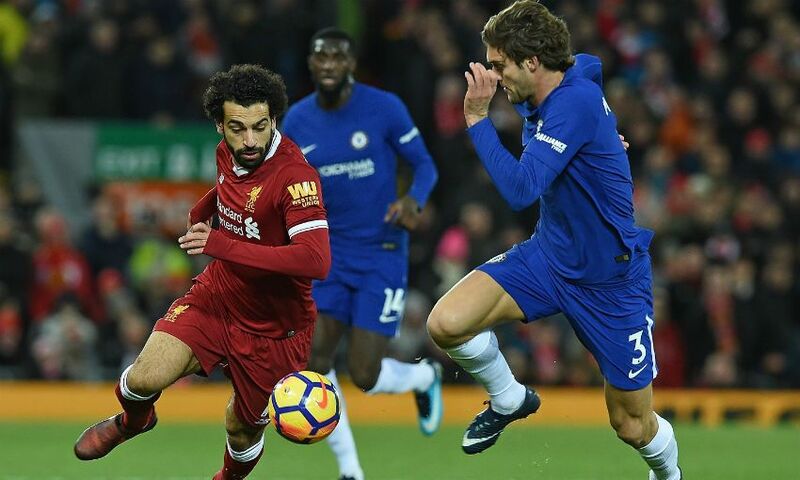 Salah then had a shot blocked after wriggling into space inside the area, while Marcos Alonso clipped a free-kick wide of the post as the complexion of the encounter took on a more open feel. The Egyptian fashioned Liverpool’s best opportunity of the opening half on 41 minutes when he majestically spun away from Gary Cahill and arched a strike inches wide of the upright, meaning the teams returned to the dressing room with the scoreline goalless. Liverpool were almost gifted an opener moments after the restart when Courtois allowed a low Sturridge cross to slip out of his gloves and spin agonisingly wide of the post. From the resulting corner, Salah’s attempted volley from a dropping ball was blocked by Cesar Azpilicueta. Meanwhile, Alvaro Morata’s miscontrol prevented a glorious chance for Chelsea after Davide Zappacosta’s low delivery from the right had found its way to the back stick. Azpilicueta then thwarted Sturridge’s blast after Salah had regained possession on the edge of the visitors’ box. But finally the breakthrough arrived with 65 minutes elapsed – and the identity of the scorer came as no surprise. Liverpool won the ball back high up the pitch and Coutinho motored forward. His attempted pass took a touch off Tiemoue Bakayoko and rolled into the path of Salah, who slid into the Kop end net from eight yards out. It was goal number 15 of the season so far for the summer signing, coming against his former club. Georginio Wijnaldum replaced Sturridge in the aftermath and, as the clock ticked towards the 90 mark, Matip had a header saved on the line from a corner, while Alonso spurned a good chance for the Blues when he hoisted volley over the crossbar. However, Chelsea levelled with five minutes remaining when substitute Willian’s attempted cross looped over Mignolet and into the goal. Lallana and Mane came into the action shortly after with Coutinho and Oxlade-Chamberlain making way as the Reds looked to grab a winner. And they could have done so had it not been for Courtois’ full-stretch save from Salah’s curling strike in stoppage time.